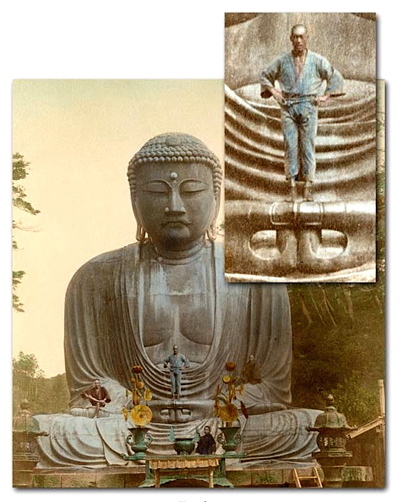 ………..not see the beauty of it.” ………..
Each of the first three chapters of Kim (1901-2) is introduced by a stanza from Kipling’s poem, “The Buddha at Kamakura,” which he wrote after a visit to Japan in 1892. It’s by no means his best poem, but it’s certainly one of the most detailed and challenging ones he ever wrote on the subject of East and West from a religious point of view. Needless to say, the poem must have interested Kipling a lot for him to have selected stanzas from it for such a crucial introduction. And they’re not easy ones either, so Kipling must have wanted readers to spend some time figuring out what they meant. Most importantly, they’re not about exotic adventure in India, or even about India, for that matter, but rather move toward the quieter, deeper, more universal themes in Kim, many of which would be new to readers even today. ………………………………….The warm wind brings Kamakura. The first stanza tries to soften Christian distaste for other religions by appealing to the warm atmosphere at Kamakura. Both “Tophet-flare” and “Judgement Day” are harsh Biblical allusions that contrast strongly with the gentle peace embodied in the place, Kamakura, and of course in the last line of every stanza in the poem. Chapter Two’s stanza, on the other hand, praises Western, non-orthodox free-thinkers who take pride in their open-mindedness to “other creeds” (this is the age of “Spritualism,” don’t forget, Theosophy, Anthroposophy, and there were big personalities involved in those movements too, needless to say). The appeal to these two, diametrically opposed groups of people at the beginning of the novel shows the degree to which Kipling’s own heart was engaged in quite a different spriritual dimension in Kim. The third introductory stanza is much more ambiguous. Devadatta was a very close disciple of the Buddha who actually rejected the Master’s “Middle Way,” preferring to stay behind in the old elitist spiritual life as an ascetic in the forest. Devadatta did not join the Buddha in his later, more gentle, holistic phase, and there is even a legend that he tried to kill the Buddha to prevent him from attaining Enlightenment. The stanza seems to suggest that whoever such people are, they are conservative and therefore unwilling, or not yet ready, in any case, to move on. They belong to an earlier world order. …………………………………The warm wind brings Kamakura. Ananda was the closest friend of the Buddha, if one would dare to say that about the Buddha, implying as it does some attachment on his part as well. In any case, this stanza would seem to celebrate the supportive presence of the Buddha in the pre-conscious mind, so to speak, i.e. in those beings who have not yet had the chance to experience life as a fully conscious human being. This is mainly just a hunch, but my feeling is that Kipling was addressing in both these last two stanzas the vast majority of Westerners, busy people too set in their ways to understand Eastern spiritual practices in their hearts. He seems to be saying that with a little help they could still come to respect and even be inspired by devotion like that shown to Amitaba Buddha at Kamakura, which has certainly proven to be true in our times. An extraordinary message for 1892, or anytime! ……………….Photo published in Brinkley’s Japan, a Guide Book (ca. 1890). …………………………………That flit beneath the Master’s eyes. …………………………………But loves them at Kamakura.